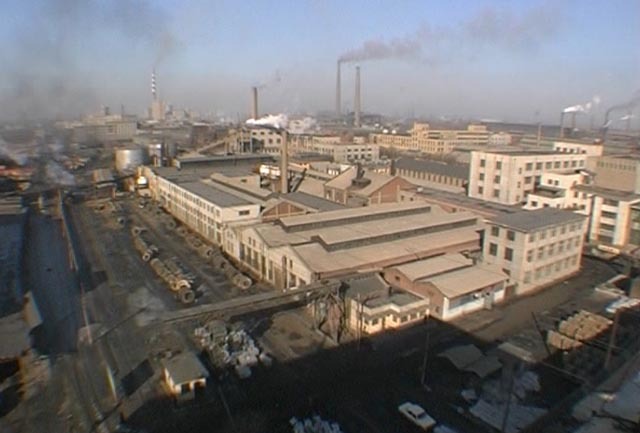 While living as a student in the northeastern city of Shenyang, Wang became interested in the region’s vast industrial areas, a landscape of factories and foundries and worker housing, all interconnected by an extensive network of railways. He began to wander through the area, gradually getting to know some of the people who lived and worked there. Then he rented a camera and started to shoot what he was seeing. 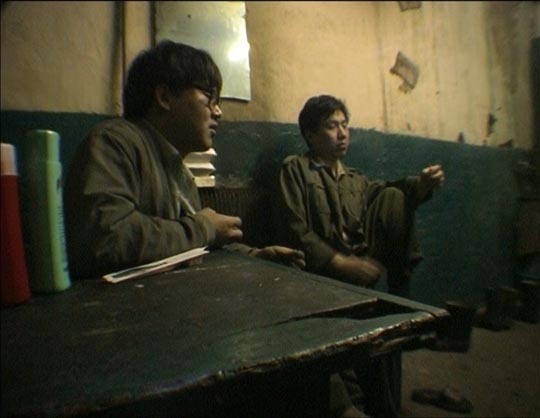 This is not a documentary which sets out to give the viewer “information” or to present the filmmaker’s argument about the economy, the social conditions, the politics of modern China. 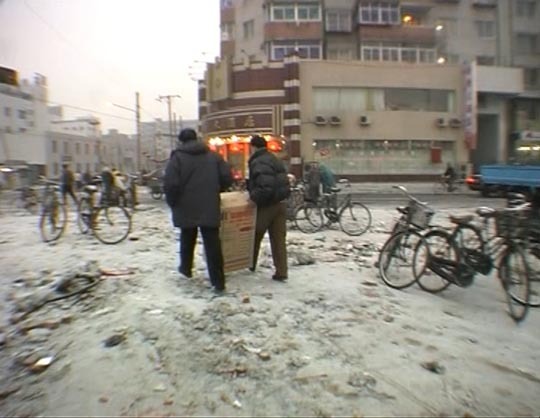 It is a film which evokes the experience of a time and a place from which the viewer can draw conclusions, recognizing on both an emotional and an intellectual level a devastating universality which much of the West shares with a China which has been undergoing massive upheavals as it transforms from a state-run to a market-driven economy. What we witness in West of the Tracks is similar to what we have seen, for instance, in Michael Moore’s Roger & Me, with its depiction of the social devastation wrought by American industrial decline. But Wang’s approach and sensibilities are vastly different from Moore’s. Wang entered this environment long after decline and decay had taken root. Factories which had once employed tens of thousands of workers now have only skeleton crews of dozens. There’s an almost science fictional quality to the images of these huge structures with their Metropolis-like machinery, populated by a handful of workers. 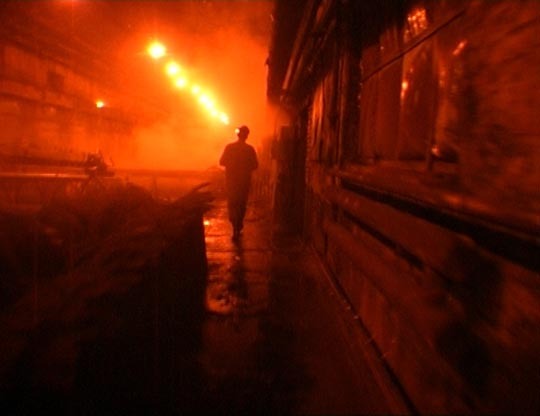 Wang evokes these spaces with long hand-held tracking shots, following these men and women along corridors, through locker rooms and communal showers, out into the vast caverns where metals are smelted and huge overhead cranes swing their loads from one end to the other. 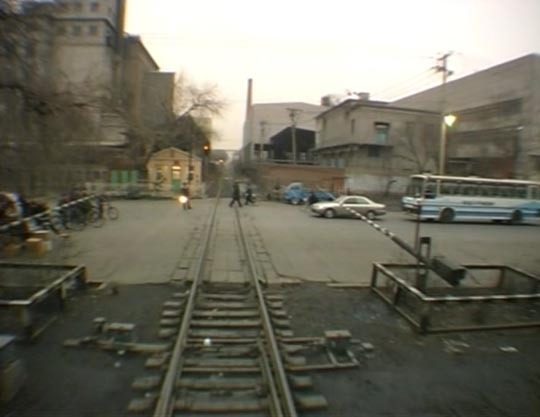 He rides the trains which weave their way among the factories, letting his lens absorb the desolate deserted wastelands. He has a fascination with process, movement back and forth, trains linking and unlinking, men pausing to eat and talk, to shower and bathe, to play their minute fleshy roles among the decaying machinery of the factories. West of the Tracks is a film of long, slow rhythms, of repetitions. 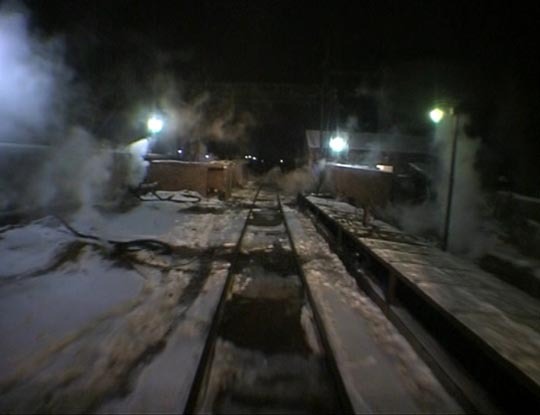 It moves through the seasons (though much of it takes place in bleak, cold winter), and a great deal of it takes place at night, as if the workers are trapped in a kind of limbo. At times it reminded me of Andrei Tarkovsky, particularly the opening section of Stalker, with its tactile sense of the sheer physical presence of the material world within which fragile human beings exist, and its insistence that the viewer adjust to the flow of the film’s own sense of time. Wang followed many threads in the two years of shooting and, as he explains in a brief interview on the first disk of this Dutch set, his first version (which screened at Berlin) tried to blend all these threads into a single whole. But that screening resulted in funding from the Rotterdam Film Festival’s Hubert Bals Fund, which gave him enough to spend a year on finalizing the edit. During that year, he arrived at his final structure, which divides the material into three separate but interlinked parts. In the first, Rust (four hours on disks 1 and 2), he presents the factories themselves and the seemingly few remaining workers. Among the lengthy sequences evoking the last vestiges of work in these places, he gives us long scenes in the lunchrooms and offices where the workers talk among themselves, only very rarely addressing the camera directly. These men and women speak about the corruption and inefficiency of the management which has eventually run all these plants (many built in the ’30s by the Japanese, before being taken over by the state after the revolution) into bankruptcy. Many of them speak of not having been paid in months, of losing their pensions. Several of the men speak of their lack of education, in passing mentioning that at their age they would have been going into high school when everything was derailed by the Cultural Revolution; they were sent to work in the countryside, their education abruptly terminated. In the second half of Rust, Wang follows some of the workers on their annual month-long visit to a clinic where they are treated to remove heavy metal toxins from their blood; they accept this as a normal part of their existence, just an unavoidable offshoot of their work. In part two, Remnants (three hours on disk 3), Wang goes into a community of workers’ housing, a warren of hovels now largely populated by the unemployed. Here, he spends a lot of time with a group of young men and women who wander about aimlessly, hang out at a little store, shyly try to initiate relationships … much like young people in any large city today. But around these people, we see the gradual destruction of the community. With the factories closing, the former workers are being driven out of their small homes by private developers who are buying up the land and bulldozing entire streets. The inhabitants talk almost fatalistically about their relocation, about not knowing where they are being moved to, of being given less space than they have had even here in their hovels. As this part of the film unfolds, we can actually see the community disappearing; the housing is torn down, people scavenge for scraps of metal and other salvageable items which can be sold for a little money. By the end, all that remains is a broad empty wasteland marked by scattered rubble. Part three, Rails (two hours on disk 4), follows the workers who drive the freight trains back and forth among the factories. But with the factories closing, there is less and less for these men to do – no more raw materials coming in, no manufactured goods to be hauled out. We join them on long nights of seemingly aimless shunting, as if going through the motions of some half-remembered ritual, like ghosts destined to repeat endlessly the actions they performed in life. But having been forced away from the tracks, Lao Du eventually finds a better place to live and even a job that can support him and his son. The film as a whole ends with a moment reaffirming human resilience in the face of crushing external forces, a communal meal with friends in the new home. Armed with a deep curiosity and a fine eye for striking imagery, in West of the Tracks Wang Bing immerses the viewer in a palpable sense of physical space while simultaneously evoking something more ineffable. This is like a ghost story, a glimpse of the phantoms who haunt a world where inexorable economic forces have declared that human beings and the communities they build to give shape and meaning to their lives are no longer important. The existence of the film and Wang’s herculean effort in giving it such a rich and elegant form provide an irrefutable counter-argument: it is the human rather than economic values that give life its meaning. Tiger Releases’ English-subtitled Region 2 PAL 4-disk set is essential viewing. 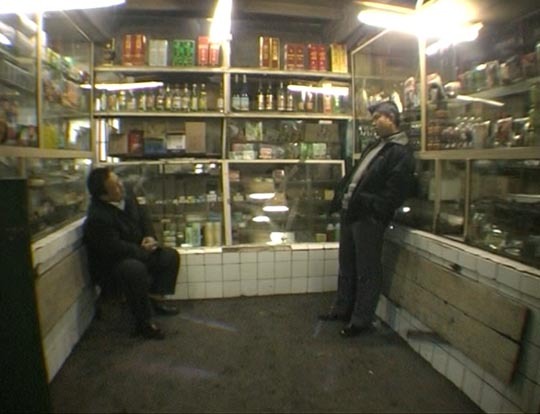 This entry was posted in Review and tagged Chinese Film, Directors, Documentary, Wang Bing. Bookmark the permalink.